Children and strength training- What if any are the risks, How and Why should they do it? We believe that Continuing Professional Development or CPD is essential for us to deliver clinically effective physiotherapy, therefore it is something that we take seriously and do on a monthly basis. This month Alistair led the session which was about strength training in children and young adults. I thought it was worth discussing some of the topics that we discussed. As there are a number of unhelpful myths that could do with being dispelled and there were some useful recommendations regarding when and how to implement strength training in children. However first some background information about the recommended levels of physical activity in children and young people to set the scene. 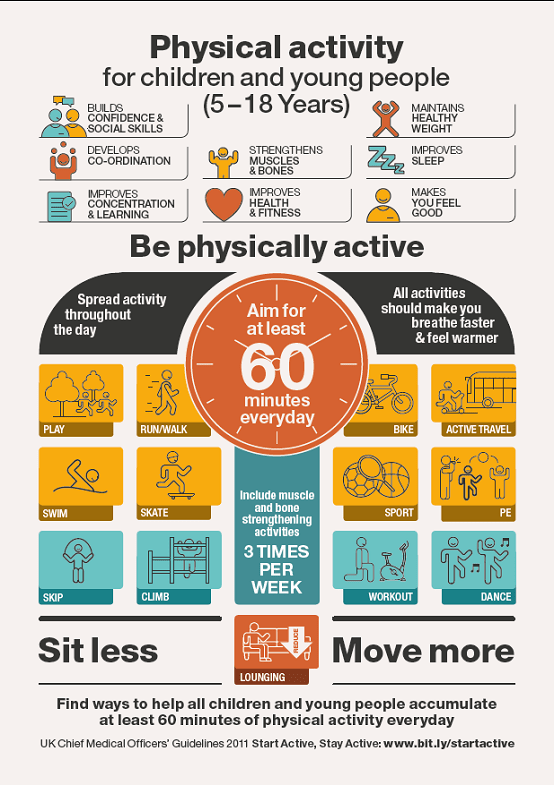 The UK Chief Medical Officers Guidelines 2011 “Start Active, Stay Active” recommend that children and young people(5-18 Years) are physically active for at least 60 minutes a day. In addition the guidelines recommend that strengthening activities are carried out 3 times a week. You can see a nice infographic summarising the guidelines on the left, a link to a poster version of the infographic here and a link to the full report here. The benefits of reaching the recommended levels of physical activity are widespread ranging from the obvious; such as strengthening bones and muscles and improving health and fitness. To the less obvious such as improving concentration and learning. So firstly what are the myths that need to be dispelled? There is potential for injury in almost any type of sport or recreational activity. With that said the consensus opinion from a wide range of professional bodies including the American Academy of Pediatrics, the American College of Sports Medicine, the American Orthopaedic Society for Sports Medicine, and the National Strength and Conditioning Association. Is that a well structured training programme has no greater inherent risk than any other structured activity. Individual examples where children are injured carrying out strength or resistance training tend to involve poor exercise selection, poor execution, excessive loading, lack of adult supervision etc. These are all failures of implementation or coaching, not a reason why sensible well coached, well planned and well executed training should be avoided. One of the commonest myths is that lifting weights will stunt a child’s growth. The simply rebuttal to this is that multiple studies have found that this does not happen. The scientific literature is clear that there is no evidence that a good, well planned and well executed strengthening programme will have any adverse effect on a child’s growth. a reduction of shoulder injuries in overhead sports such as swimming. a reduction of lower limb injuries including muscle strains and ACL ruptures in sports such as football and rugby. an increase in strength that leads to an improvement of motor skills such as long and vertical jump, 30m sprint speed, squat jumps and agility runs. Therefore there are a wide range of reasons why participation in a strengthening programme is a productive, positive thing to do. Even if you or your child are not particularly interested in sporting performance. If your child has any musculoskeletal problem whether it be back pain, neck pain, shoulder pain, knee pain, a sports injury or growing pains; then almost certainly a strengthening programme will be central to getting them better. At what age can children start a strengthening programme? There is no minimum recommended age for starting a strengthening programme, although children should be able to follow directions and demonstrate adequate balance. This generally occurs around age 7 or 8. Is there anyone that shouldn’t participate in a strengthening programme? The American Academy of Pediatrics or AAP recommends children with cardiomyopathy, pulmonary hypertension, Marfan’s syndrome (with dilated aortic root), stage 2 hypertension and those undergoing chemotherapy (with anthracyclines) should not perform strength training. Children with seizure disorders should be able to demonstrate good seizure control before commencing. Obviously it goes without saying that if you have any doubts or concerns you should discuss them with your GP or specialist, if your child is under the care of a specialist. The key is that any resistance programme needs to be well planned, coached and carried out. Therefore if your child has pain or any functional limitation and you want specific advice regarding strengthening exercises as part of an overall treatment approach, then please contact us to get your child booked in. Our clinicians have extensive experience treating children participating in a wide range of sporting and non sporting activities. If your child just wants to get stronger and doesn’t have any pre-existing health issues, then we would recommend getting proper advice and coaching from experts such as Level 10 who have extensive experience coaching and working with kids. any programme needs to follow the principle of progressive overload. the child needs to be able to move and control his or her own body, before adding external load. six to eight exercises should be used per session, starting with 1-2 sets of 6-15 reps.
exercises should be chosen to work all the major muscle groups and performed through the full range of movement that is available. sessions should be performed 2-3 times a week on non-consecutive days, there is no benefit to training 4 times a week. overriding emphasis of any strength programme should be on proper technique and safety, not how much weight can be lifted. Booking an appointment with a Physio. This entry was posted in What we have been up to and tagged CPD. Bookmark the permalink.